Backups are Important! Really They are!. Restoration process is hectic, yes it is. Moreover, Disk is getting full all the time just because of backups? Always facing low disk space problems? 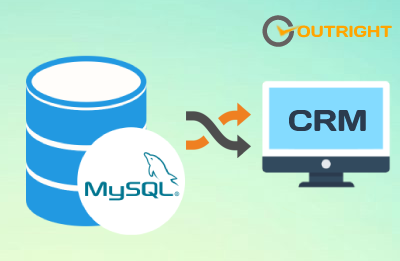 What if CRM automatically takes backup, retain it until you need, keep it simple, while making a new backup zip, remove an old one!. Configure your backup retention peried like a 3 days or a week. Easy UI based download and restore process. Automatically remove backups which you don’t need ie after your retaining period. 1) Each Backup file is compressed. 2) ListView approach to know when they created , download link and one click restore link. 3) Notify on each backup start / finish. 4) Each backup identified by it’s name , date created ,it’s size. 5) Set 3 backups each day , set their timings. CRM should have the Outright utils file, if not then install the OutrightUtils package first then install the Backup-Restore Manager. 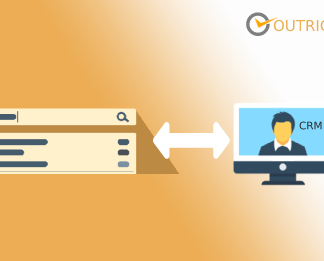 Click on the Outright FTP Settings to establish connection between CRM and FTP Server, generated backup will move to ftp server once the configuration is done. 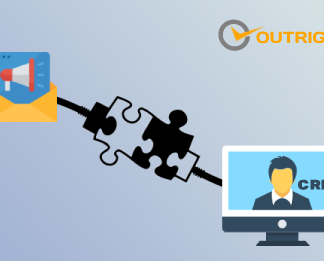 Click on Outright Key File Upload, to upload the key file of server to establish the ftp connection between CRM and FTP server. Go to “DB Backup Settings”. 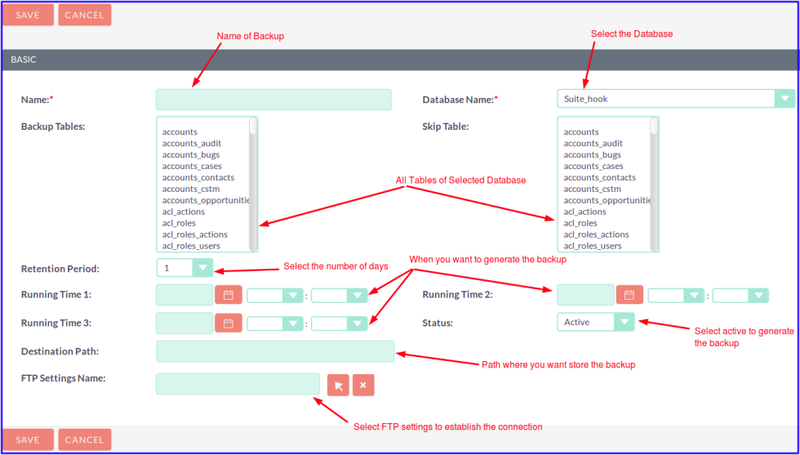 Click on create to configure the database backup setting. Name => In this field we insert the name of the record, like which name you want to give the backup record. Database name => In this dropdown field we have to select that database which backup you wants to create. Backup Tables => In this dropdown field we have to select only those tables of selected database which backup you wants to create. Skip Tables => In this dropdown field we have to select only those table which against you don’t want to create backup. Retention Period => In this dropdown field we have to select number of particular till days you want to retain backup after that back will be removed permanently. example:=> Suppose you want to retain your data for 1 day then you will enter 1 after 1 day it will be removed permanently. Running Time 1 => In this field we are having calendar along with time section you have to select date and time when you want to generate backup. Running Time 2 => In this field we are having calendar along with time section you have to select date and time when you want to generate further backup. Running Time 3 => In this field we are having calendar along with time section you have to select date and time when you want to generate further backup. We have to select the Active option if we want to create backup if not then we will select Inactive option. Destination Path => That path where you want to generate the backup, if path does not exist then it will create the folder of given path for database backup. In this module, generated database will appear in a list view. Below we have mentioned fields of outr_outright_backup_restore. Name => Name of backup which we have generated in zip file. Date Created => Created date of database backup will appear in this field. Expiry Date => Expiry date of backup after this date it will be removed. Backup size :=> In this field backup size will appear. 1 . 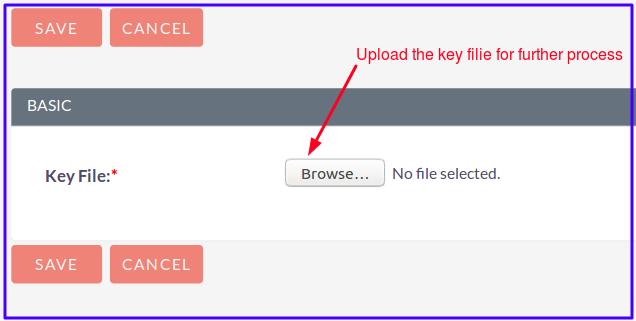 Download => We can download the generated backup file with a click. 2 . Restore => When we will click on restore it will redirect to this outr_ORM_restored. In this module a list will appear of restored database backups and below mentioned fields will appear. Name :=> Name of backup which we have generated in zip file. Restore Id :=> Restored backup id will appear here. DB name => In this field database name will appear which backup we just made. Status :=> We will get active (action) on this field When we will click on it will create a database and then status will be inprocess, after the process is complete it will appear Complete. I was worried about my backups, their consistency and charges over keeping them on disk. Great product which handles everything by it’s own including retention period option. It saved my hours and hassles of taking backups and keeping them!! Restoration is a beautiful part.